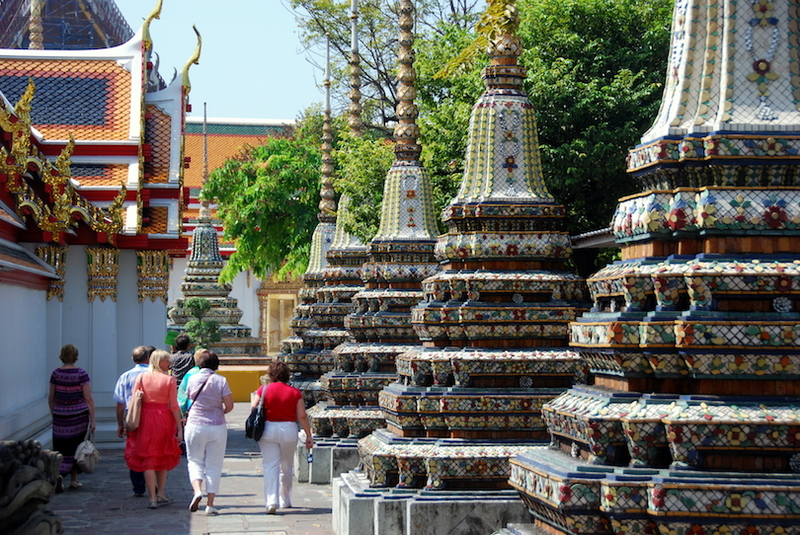 Always surprising and refreshing, Bangkok is a must on most people’s South East Asian trips. 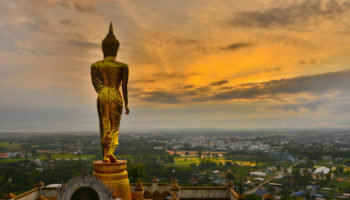 Attracting a whole host of different tourists from all over the world with its depth of history, culture and traditions, the Thai capital remains a buzzing destination on many backpacking itineraries, but also a great place for those looking to soak up Thai culture during a vacation. 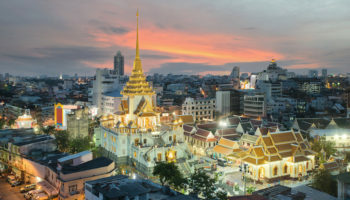 Bangkok is truly a city with something for everyone, whether you are looking to stay among the nuances of local Thai life, or wanting to drink in the city’s late night bars and clubs. The city has undergone much modernization over the past few decades, transport links have developed and improved with the skytrain and the metro; buses and taxis – although less reliable – are still easy to comeby. The accommodation on offer in the city is often fantastic value for money with many hotels offering a high standard of service, too. There has never been a better range of great hotels to stay in from upmarket 5-star extravagance, to clean and modern budget hostels. This wonderful city is ready for your next adventure, so read on to find out where to stay in Bangkok. This is the area of the city that has the highest concentration of shopping malls. It is in the fashionable and modern Siam where you will find Bangkok’s big cinemas, trendy restaurants and sizable entertainment centres. 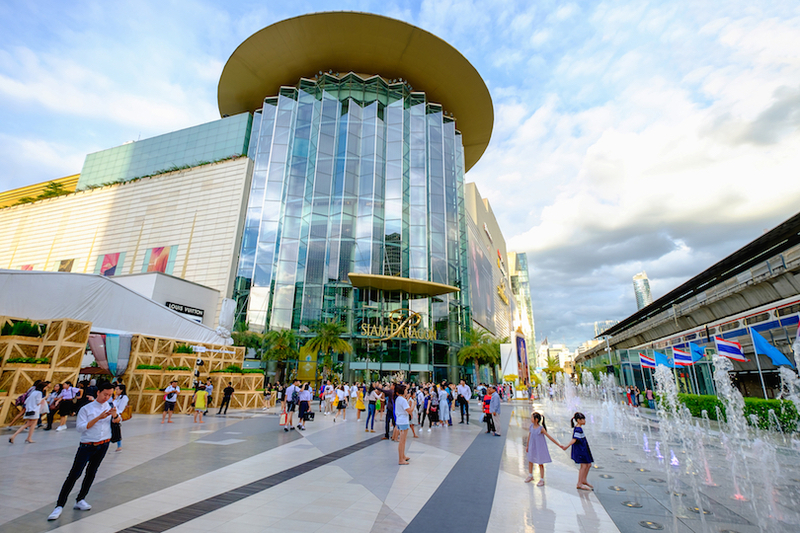 All the big global retail names can be found inside the air-conditioned walls of places such as Siam Paragon, Siam Centre and Siam Discovery, to name just a few. Once you’ve had enough of the designer brands, you can head to the Siam Square where the on-trend kids spend their cash in the smaller boutiques that offer quirkier styles. 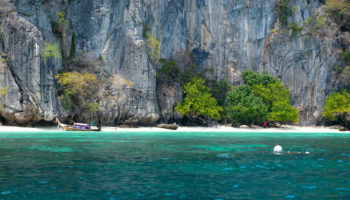 The area also has some interesting cultural sides; Jim Thompson’s House gives visitors a glimpse of a Bangkok of the past, or you check out one of the biggest aquariums in the world at Siam Ocean World – you can even have a go at ice skating on an Olympic size rink, or watch a Thai boxing match for free outside the MBK shopping mall. 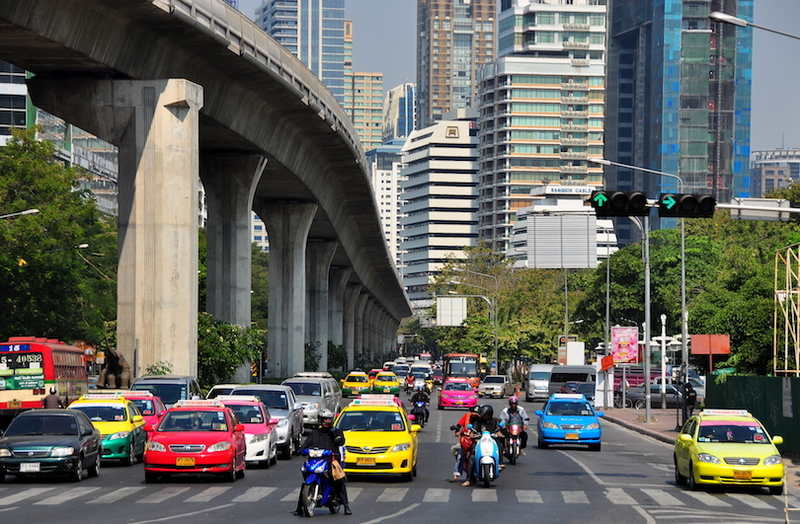 Siam is where Bangkok locals come to shop and spend time with friends which means that at the weekend the area gets busy and pretty congested with traffic, but it also means it has great transport links to other parts of the city. The hotels on offer in the district range from the more high-scale to budget hostels, meaning there really is something to suit everyone’s price range. Pathumwan Princess Hotel – This huge hotel is decidedly luxurious, that’s for sure. There are a variety of rooms on offer, but all of them are spacious, stylishly decked out with big windows and contemporary, design-led decor. Pathumwan Princess Hotel also boasts ten dining options, running the gamut from Italian to Korean and Thai. There’s also a lobby cafe and a bar that plays jazz music in the evenings. This 5-star option is located opposite Siam Square and MBK Shopping Centre. Mercure Bangkok Siam – Complete with a rooftop pool area that looks out over the city, this Bangkok branch of Mercure features modern rooms decorated with a mix of minimalism and funky color pops. There’s a variety of rooms for guests to choose from at this hotel. You’ll find a restaurant here, plus a bar located on the 9th floor boasting great views. 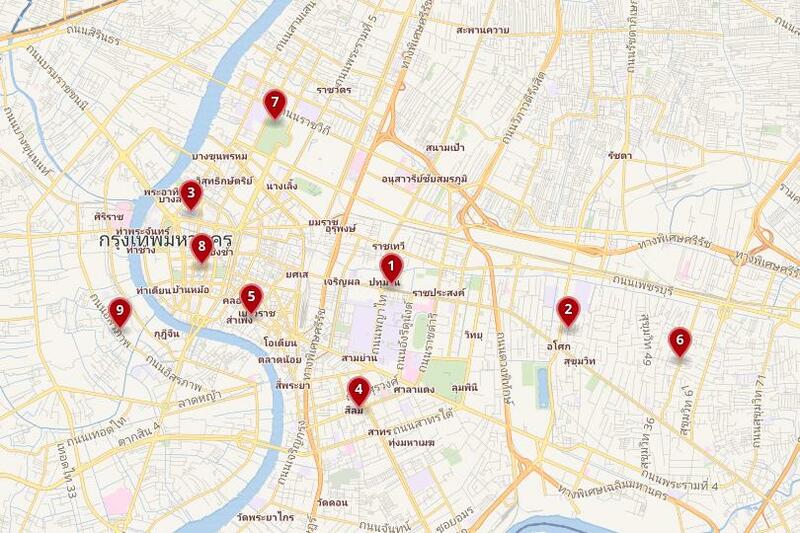 In terms of location, this hotel is nearby big malls such as MBK Shopping Centre and Siam Square. Happy 3 – The rooms at Happy 3 feature clever use of space, clean lines and contemporary furniture with a neutral color palette. There’s a restaurant and bar, as well as a rooftop terrace where guests can enjoy drinks overlooking the downtown city skyline. There’s also a relaxing pool area surrounded by greenery. A hotel that’s perfect for relaxation, it’s located just five minutes’ walk from a BTS station, plus it’s close to the Jim Thompson House and Bangkok Arts and Culture Centre. A popular expat hangout, the central district Sukhumvit is as cosmopolitan as it is fun and boasts a whole load of choice when it comes to entertainment. 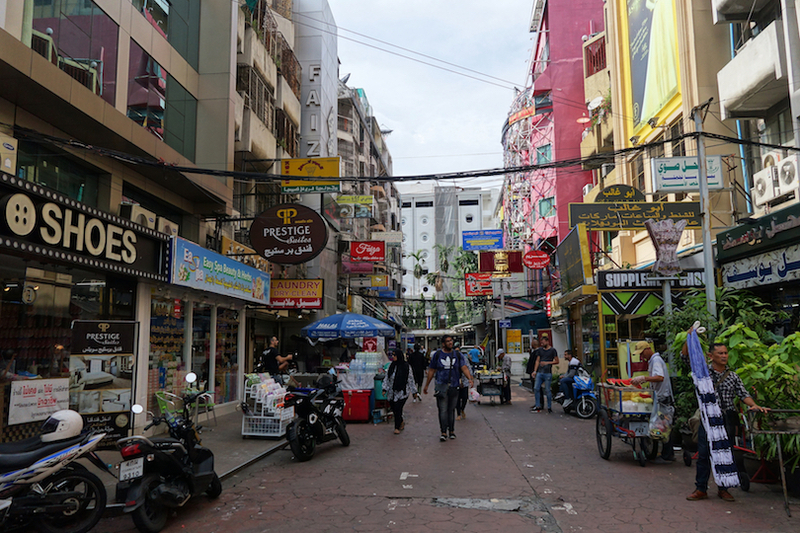 There isn’t a lot of traditional everyday Thai life in this district, and it lacks tourist attractions, but it is connected to the skytrain and the metro, which means it is easy to get around the city. This is a great area to stay in if you like food from all over the world: just a short walk along the street in Sukhumvit and you will find Lebanese food being sold next to Italian pizza, and then some Thai street food to tempt you further. If you like spending your evenings eating, drinking and dancing, then Sukhumvit is the area for you, and there are a lot of great hotels to choose from, so you can rest your head after a night out partying, whether it be in a dorm room or in a queen size bed at a luxury hotel. The Landmark Bangkok – With touches of traditional Thai design throughout, The Landmark Bangkok is housed in a large, impressive building, and provides everything you’ll need for a comfortable stay in the city. Rooms feel warm and homely as much as they’re stylish and brightly lit. There’s an incredible rooftop pool area, which is well maintained and features a Jacuzzi and sun loungers. There are nine dining options as well as a four-story shopping complex. The nearest BTS station is right on the doorstep of this 5-star hotel. The Davis Bangkok – This sophisticated hotel is decked out in a modern style and boasts Thai style villas as annexes. 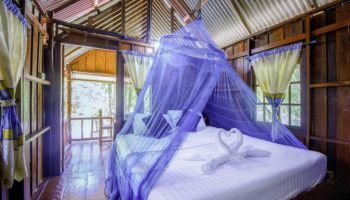 The rooms are plush and upscale, with large beds and wooden furnishings, all wrapped up with touches of ornate Thai design details. There is a selection of pools for guests to enjoy, plus a fitness center that features a rooftop whirlpool. Staying here means choosing to stay in one of the villas or in the hotel building itself. Travelodge Sukhumvit 11 – This branch of Travelodge comes with a glass edged, infinity-style pool on the rooftop, perfect for soaking in the water whilst admiring skyline views. There’s a contemporary, spacious in-house restaurant, where guests can enjoy breakfast and evening meals. You’ll also find a well-equipped fitness center onsite. The clean rooms here are simple and minimally designed for style and comfort. As for location, this hotel is located on Sukhumvit Soi 11, close to a BTS station and the vibrancy of Arab Street. Khao San road has a notorious reputation all over the world: most know it from the famous opening scenes of the movie The Beach which still attracts many travelers looking for the same euphoric experience of finding adventure in a tropical land. The area today is a mecca for many backpackers – this is where travelers head if they want to drink cheap alcohol, eat strange food and get tempted in awe by the infamous ping pong shows. But, there is still more laid back fun to be had in the area. Neighboring Banglampou offers up a glimpse of Bangkok of the past (before the revelry took over), with its interesting markets and quaint traditional shop houses. 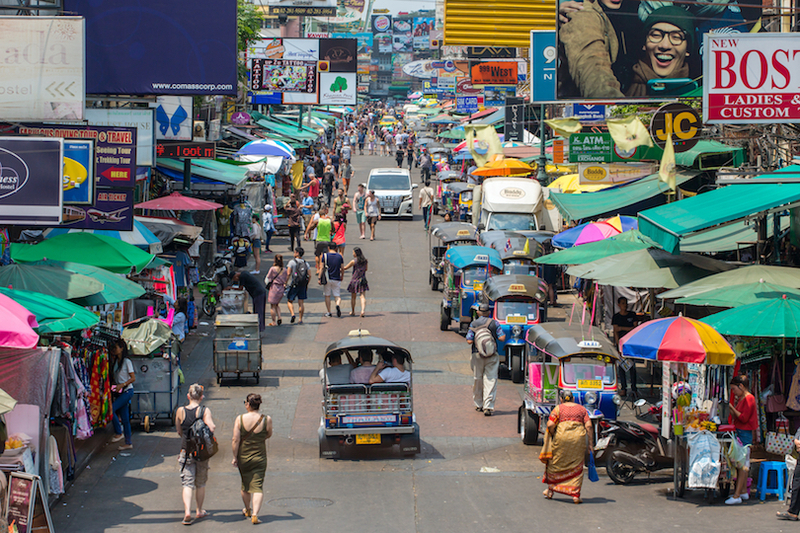 Khao San has become part of the patchwork that makes up Bangkok and, although rowdy, there are some good and reasonably priced hotels and hostels to stay in, some with swimming pools and roof terraces. 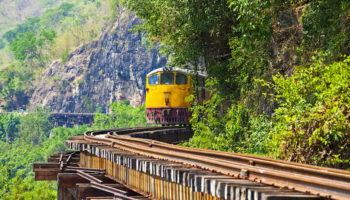 It is also well connected and great if you plan to travel to other parts of Thailand as many of the buses pick up and drop off passengers in the area. Chillax Resort – Close to all the backpacker action of Khaosan Road but far enough away for a peaceful night’s sleep, this 4-star hotel features a stylish rooftop infinity pool where guests can swim with skyline views. The rooms boast plush furnishings and spa baths all done in a decidedly luxe style. The lounge features tiled floors, high ceilings, and chandeliers with purple mood lighting. 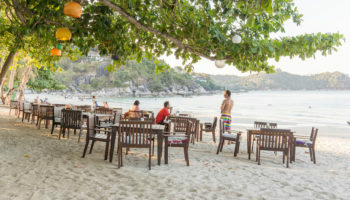 The restaurant serves up a wide range of International cuisines, but you can just grab a drink and light bites from here, too. Nouvo City Hotel – Nouvo City Hotel is a modern boutique hotel that’s close to many Bangkok attractions, like Khaosan Night Market and the Democracy Monument. The rooms feature wide beds and wooden floors and have a decidedly boutique style. They are decorated with modern art and a monochrome palette with purple color pops. There’s a relaxing rooftop pool here, as well as a fitness center and two restaurants to choose from. On top of that, you’ll also find a small spa with a cafe attached. Taraplace Hotel Bangkok – Offering fantastic value for money, this hotel boasts large, elegantly decorated bedrooms, all done in a neutral color palette. They’re all very clean and well maintained. Down in the lobby of this family run hotel, there’s fresh fruit and hot drinks available free of charge all day. The rooftop terrace is a nice place to relax after a day of exploring the city. Taraplace Hotel Bangkok is well positioned if you want to explore what the lively Khaosan Road has to offer; plus, it’s just a 10-minute walk to the majesty of the Grand Palace. The perfect area to stay in Bangkok if green spaces are important to you, Bang Rak and the adjoining Si Lom district are close to Lumpini Park, where you can sit and soak in the everyday lives of Bangkok locals as they exercise together and spend time with their families. The food is also delicious around these areas as many eateries serve up more traditional Thai cuisine for very reasonable prices. The skytrain threads its way through both of the districts and the Si Lom metro stop adds to the easy transport to other areas in Bangkok. 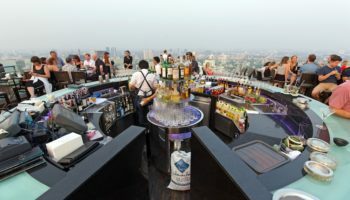 Evenings in the area are buzzing, with the Patpong night market in Si Lom, which will offer you the chance to try out a plethora of Thai street food – you can then finish off your night sipping cocktails at a glitzy rooftop terrace and take in the lights of the Bangkok skyline at one of the 5-star hotels in the area. Shangri-La Hotel Bangkok – A sprawling luxury offering, the Shangri-La Hotel Bangkok boasts an award-winning restaurant as well as a whole lot of other dining options. Guests can keep up with their workouts at the fitness center or even join in fitness classes. At this hotel, you’ll find a shopping arcade and even a clinic. Decadent Thai interiors combine with contemporary chic in the rooms, complete with views of the river. Location-wise, this 5-star hotel is situated alongside the river and is very close to a BTS station, too. The Grand Sathorn – The rooms at The Grand Sathorn are hugely spacious. They’re decorated with modern style in mind and come complete with large pieces of brightly colored modern art. Some rooms even feature a kitchen and lounge. There’s a rooftop pool and sundeck for sparkling city views at nighttime. An onsite restaurant at this hotel serves up local dishes. Close to a variety of street stalls, the hotel also offers a free riverboat shuttle to Asiatic The Riverfront. Chinatown, known as Yaowarat, is an old area of the city where the first Chinese traders settled and still remain to this day, a warren of wonders where anything and everything Chinese is sold and bought along the small streets and inside the strange shops. Phahurat is similar to Yaowarat except it is where Indian immigrants have come to settle over the years and is where you will be able to buy all sorts of strange and wonderful things. 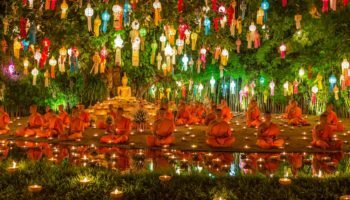 The depth of culture and history in the area is a testament to the strength of Thailand’s cultural influence and is a fantastic base in the city if you want to shop for oddities and get lost in the various cultures that make up Bangkok. 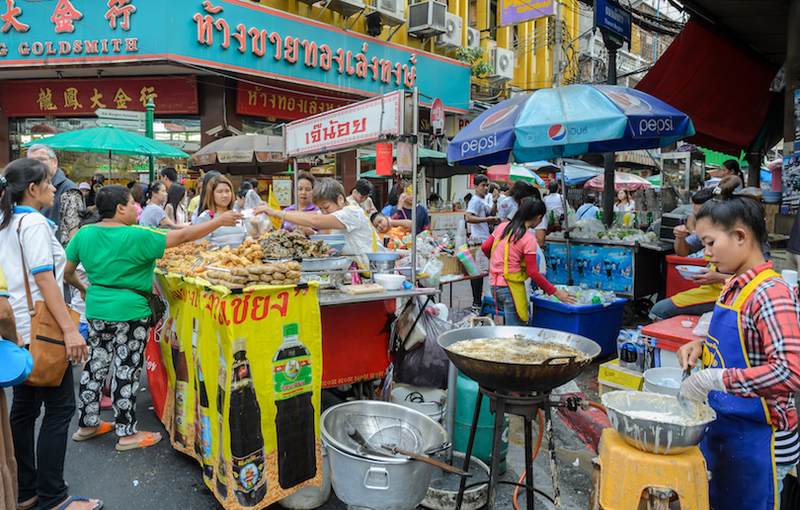 The sheer wealth of food being cooked and sold in these district will make your taste buds explode, and with many of Bangkok’s big sites in walking distance these Asian areas offer some good accommodation for those on a budget. Shanghai Mansion Bangkok – With an Old World meets Shanghai colonial style, this 4-star hotel is all about complete opulence; it’s amazingly ornate. The cool building itself dates back to 1892 and boasts an elegant restaurant and jazz bar. Incredibly, each brightly colored room comes complete with a free minibar – as well as four-poster beds and a lot of silk. There’s a library here, as well as a 5-story indoor garden. Norn Yaowarat Hotel – Situated in the heart of Bangkok’s Chinatown, Norn Yaowarat Hotel is a very cool place to stay. It’s all stripped back minimalism and light wood, with a neutral color palette throughout. Rooms feature polished concrete bathrooms, and some offer balconies. The accommodation includes dormitories with pod-style beds, which are perfect for a truly budget stay in Bangkok. There’s also a large, open plan lounge where guests can relax after a busy day with a coffee from the coffee shop. A trendy and hip area, Thong Lor is where you will find a selection of Bangkok’s many swanky bars, fashionable nightclubs and a whole range of restaurants serving delicious cuisine from around the world. This is the place to come if you are into chic boutique shopping and classy hangouts where you will be mingling with Bangkok’s hip, young and affluent crowd. The area has become more popular with foreign tourists recently, attracted to the district by the sophisticated nightlife and flourishing international dining scene. Thong Lor has great public transport links with the BTS Skytrain stopping off at Thong Lo at the start of Sukhmvit Soi 55 which is the name of the main street in the area. With the boom in upscale establishments spreading through the district, the streets around Thong Lo station such as Ekkamai have started attracting trendy new business ventures. Accommodation in Thong Lor is not the cheapest in Bangkok, but the hotels are often elegantly decorated in a contemporary style and have a range of facilities for guests, such as swimming pools and yoga classes. More affordable accommodation can be found in the area in guesthouses that offer rooms that are more down to earth but comfortable and clean. Bangkok Marriott Hotel Sukhumvit – For true high-rise luxury with unforgettable views across the city, Bangkok Marriott Hotel Sukhumvit is the place to stay. Situated on the topmost floors of a skyscraper, the rooms are highly polished and feature tiled marble bathrooms, where you can enjoy a bath with city views. 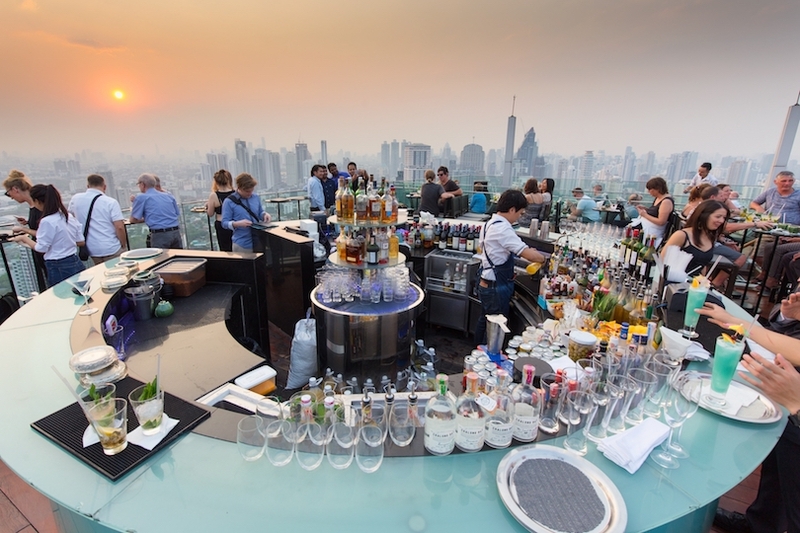 The most eye-catching part of this 5-star hotel is the rooftop restaurant, with beautiful panoramic views of Bangkok. There’s also a pool on the rooftop. For added convenience, a BTS station is located in the same building as the hotel. Grande Centre Point Sukhumvit 55 – This luxury hotel is another decidedly high-end option. It’s a wildly sophisticated hotel and features design-led interiors with touches of gold everywhere, in sleek and modern palatial style. There are Japanese style Jacuzzis for guests to use, as well as a polished rooftop area complete with pool and amazing city views. There’s also a large gym and a selection of dining choices. High-end malls, such as The Emporium, are located nearby; there’s even a shuttle service to the nearest BTS station. Since the 1900s Dusit has been known as a place of luxury when King Rama V build Dusit Palace. With its decadent royal residences and intricate European inspired architecture the Grand Palace is the heart of Dusit and many of the buildings in the surrounding streets were developed alongside the Palace and as a result are now beautiful wide, leafy avenues. 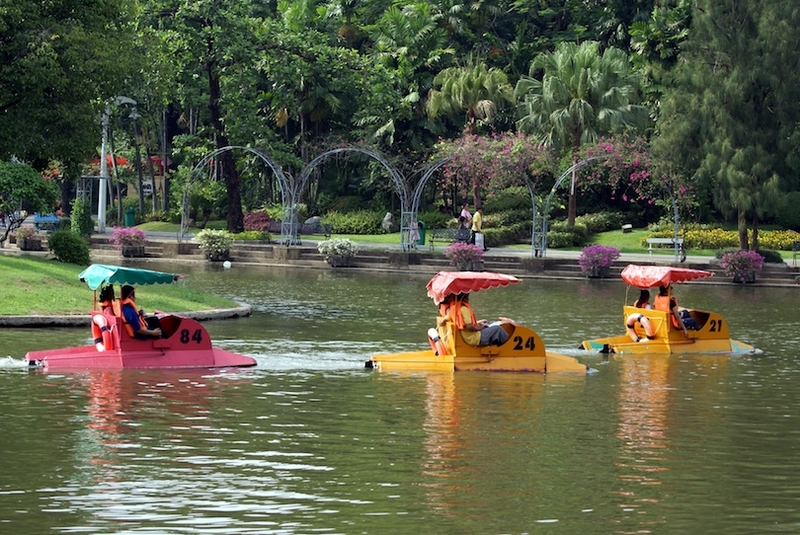 Public transport around the Dusit area is fairly simple with the river ferries serving the district as well as buses. 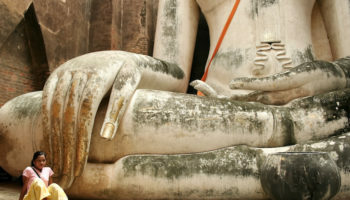 There are many museums, parks, monuments and temples around the area for visitors to spend days exploring and learning more about Thai history and culture. This is not an area to stay in if you want nightlife on your doorstep, but the rowdy Khao San road is a walk or a short taxi ride away. There is not a huge range of hotels to choose from, however there are some smaller guest houses in the area that offer great value for money. The Raweekanlaya Bangkok – Surrounded by greenery and nature, The Raweekanlaya Bangkok is set around a historic building built in the 1800s for the Royal Governess. Tastefully traditional and classically minimalist, the rooms feature white-washed walls, shuttered windows and soft lighting – and have garden views. The garden itself is a calm oasis in the bustling city and boasts a swimming pool, as well as a 120-year-old banyan tree. There’s a restaurant on site but the surrounding streets have plenty of street food options and sights in the form of grand, official buildings like the National Library. This is the district where many of Thailand’s most iconic historic monuments can be found, so Ratanakosin is the place to stay if you have a few days in Bangkok and want to learn more about the culture and history of Thailand. It is here that you will find the iconic Grand Palace and the very important Wat Pho among the wealth of museums, parks and monuments that can be found around Ratanakosin. The river is important in Bangkok for transport with many locals commuting by river ferry. Using the ferry service is a fantastic way to get around the city, and Ratanakosin is well connected by river ferry services and also main buses frequently run through the area. If you like boutique hotels this is the area for you with small, quirkily designed hotels nestled in historic buildings. Sala Arun Aparthotel – The rooms at this 4-star hotel are all about their views. Balconies overlook the river, across from which you can see the beautiful temple of Wat Arun. They’re decorated with wood and natural fabrics in a polished, yet simply elegant style that reflects the traditional riverboats of Bangkok. There’s a rooftop bar at Sala Arun Aparthotel, which is the perfect spot for sunset drinks and romantic dinners. The Charming Thonburi district stretches along the west bank of the Chao Phraya River which differs from the rest of the capital in its peaceful, laid back atmosphere. Once the site of the original settlement of Bangkok, Thonburi has seen modern development in recent years but traditional life still remains here. 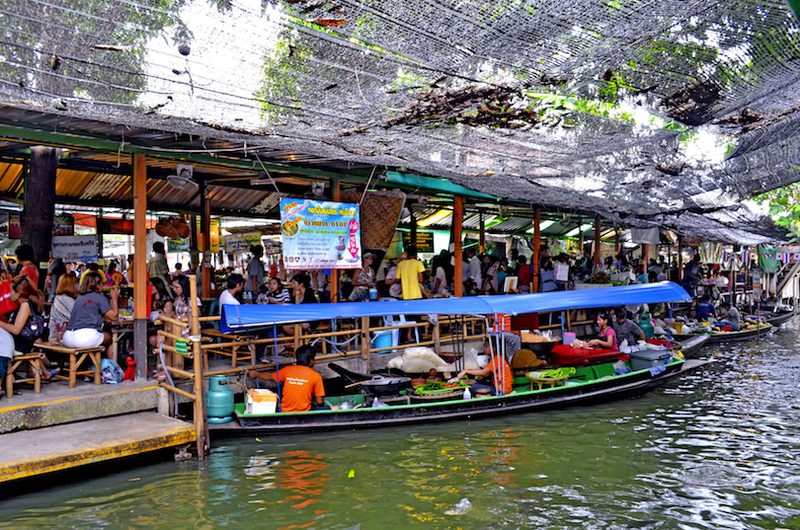 This is where you will find Bangkok’s famous floating markets along Thonburi’s network of canals. The area is also great for exploring museums to learn about Bangkok of the past, Thonburi is perfect for those who are watching the pennies, as the food in the locals’ markets is affordable and delicious. 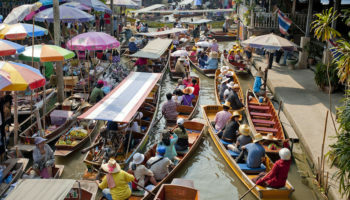 Riverside hotels and luxury lodgings are the top places to stay in the neighborhood and, although it is not the best connected neighborhood in Bangkok for public transport, the river ferries are frequent and remain the easiest way to reach Thonburi. AVANI Riverside Bangkok Hotel – Fresh, elegant, minimalistic interiors are the name of the game at this luxury hotel. Large windows in the understated rooms boast views of the river. Each room also comes with the use of a smartphone – handy for city maps! There’s a fitness center as well as a rooftop infinity pool. There’s also a selection of dining options. This 5-star hotel is actually connected to the Riverside Plaza with all of its shopping, bars, and eateries. Anantara Riverside Bangkok Resort – True to its name, this hotel is more like an inner city resort. There’s a sprawling outdoor area next to the river, dotted with tropical trees and boasting a large swimming pool. The rooms at this hotel are varied, with many different options to suit different guests; some even come with access to an executive lounge. Ten dining options mean you are spoiled for choice – one of these includes a glittering riverfront bar. There’s a private boat shuttle to the nearest BTS station.